OXFORD, Miss. 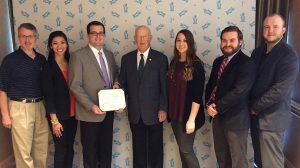 – The University of Mississippi School of Pharmacy’s student chapter of the National Community Pharmacists Association was recognized as the Most Improved Chapter of the Year at the NCPA Convention in Orlando earlier this month. Ole Miss has an active chapter, often hosting events that allow students to learn more about careers in independent pharmacy. Many of its members participate in business plan competitions while also taking advantage of travel opportunities for conventions and special events. Some members, including Van, also are active in the national organization as representatives on the Student Leadership Council, a selective group of student leaders from across the nation chosen to represent NCPA. Even with its award in hand, the chapter’s work is far from done. “Now that we have won Most Improved Chapter of the Year, I feel like the work is just starting,” Van said. “I would love for us to continue to be more active in advocacy and community outreach, because that is truly what the profession is about: serving the community.